When you think “vehicle maintenance,” the windshield wipers would probably be the last thing you think about. Though easy to forget about, they should not be ignored. Visibility is essential for being able to drive safely, which means we need to make sure our wipers are in shape, and replaced when needed. Broken frame – detachment of frame arms at joints or connection points. Metal Corrosion – especially at joints and claws. Visible cracks, tears, and missing pieces in the rubber squeegee’s edge. 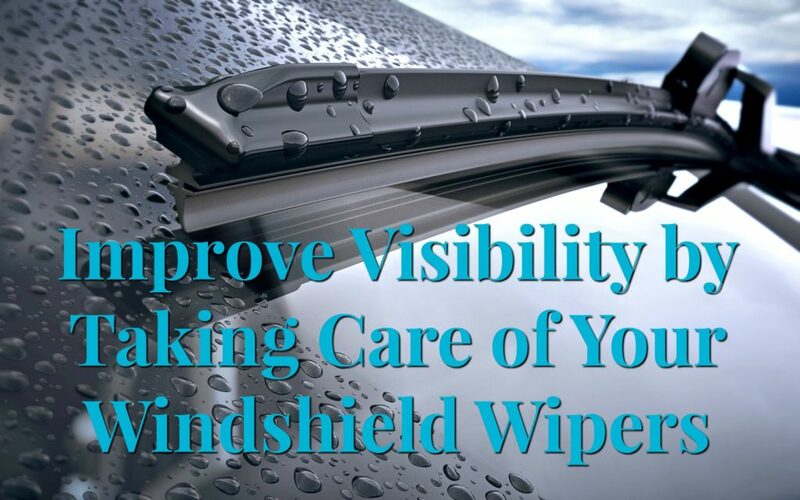 Check squeegee wiping edge for rounded edges which can prevent the wiper blade from making strong contact with the windshield and reduces wipe quality. Tug to ensure wiper blade has been securely installed on the wiper arm. Check that squeegee is secure in the wiper frame. Skipping occurs when the blade develops a curvature from lack of use (e.g. left in the ‘parked position’ for an extended length of time). Splitting is caused when the sun’s ultraviolet rays penetrate the rubber squeegee, causing it to breakdown and separate from the frame. *All the above reduce visibility and slow reaction time while driving. Wiper blades should be checked every six months and changed at least once a year, or whenever you notice a decrease in visibility. Replace wipers immediately if you notice streaking, skipping or bouncing, splitting, or squeaking. These things indicate that the wiper blades are no longer maintaining proper contact with the windshield. What Causes Wiper Blades to Deteriorate? Pull your wiper blades away from the windshield during winter months to prevent ice build-up on the rubber squeegee and to prevent them from sticking to the windshield. If you have just replaced your wiper blades and are still experiencing problems, you may be wondering what exactly is going on. A common issue that windshield wipers experience has nothing to do with the blades themselves. When there is a problem with the windshield wiper motor, you’ll notice that your windshield wipers work perfectly fine on the low speeds, but begin to malfunction at higher speeds – wipers only rise up and down approximately four inches, and when the wipers are shut off, they do not sink to the appropriate spot. The electrical components controlling the windshield wipers are in the wiper motor, and occasionally these electrical components go bad. Your trusted mechanic can easily help you solve this problem. Make sure you include windshield wiper checks in your regular maintenance routine. Having reliable wiper blades is as important to a vehicle’s safe operation as good tires and brakes. As always, you can contact Virginia Auto Service for any of your car maintenance needs.